Note: These are delicious - they are like a little taste of Thanksgiving! The insides are a more crumbly filling. It is probably best to eat them with a fork and knife as they are a little too big to serve as fingerfood. Tear bread into pieces and pulse to coarse crumbs in a food processor. Transfer to a bowl and toss with oil, 1/4 teaspoon salt, and 1/8 teaspoon pepper. Spread in a shallow baking pan and bake in middle of oven until golden, 6 to 8 minutes, then transfer to a bowl. Pull stems from mushroom caps and finely chop stems. Put mushroom caps, stemmed sides down, in a lightly oiled large shallow baking pan and bake in middle of oven until mushrooms exude liquid, about 10 minutes. While mushroom caps are baking, melt butter in a heavy skillet over moderately high heat until foam subsides, then sauté chopped stems, stirring, about 5 minutes. Add onion, celery, garlic, oregano, and remaining 1/4 teaspoon salt and 1/8 teaspoon pepper and sauté, stirring occasionally, about 5 minutes. Cool slightly, then add to bread crumbs along with crumbled sausage, cheese and parsley and toss well. Turn mushroom caps over. Using your hands, form firm 1-inch balls of the filling (like meatballs) then press into mushroom caps (there may be some filling left over). 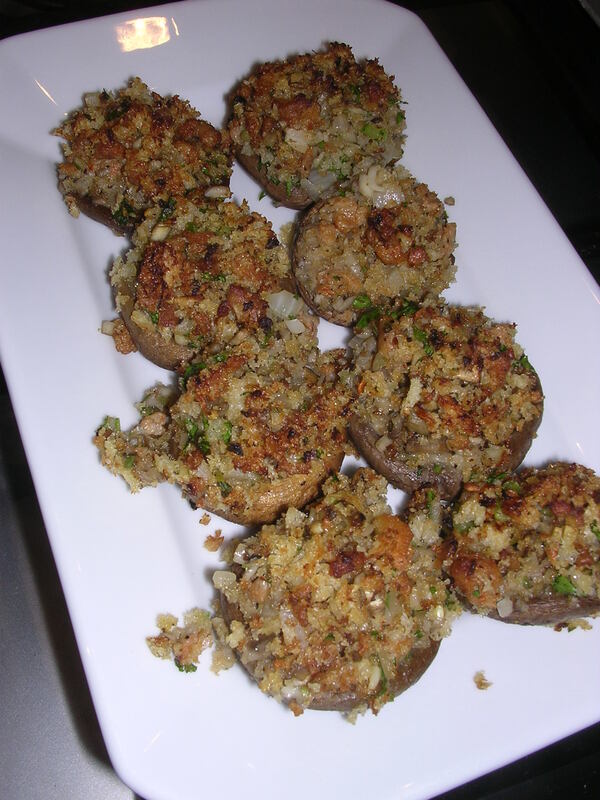 Bake in middle of oven until mushrooms are tender and stuffing is golden brown, about 15-20 minutes. Cool about 5 minutes and carefully transfer to a serving platter using a spatula.